An organ system is a series of organs and tissues within a multicellular organism. An organ system functions together and with the body as a whole to provide a service to the organism. 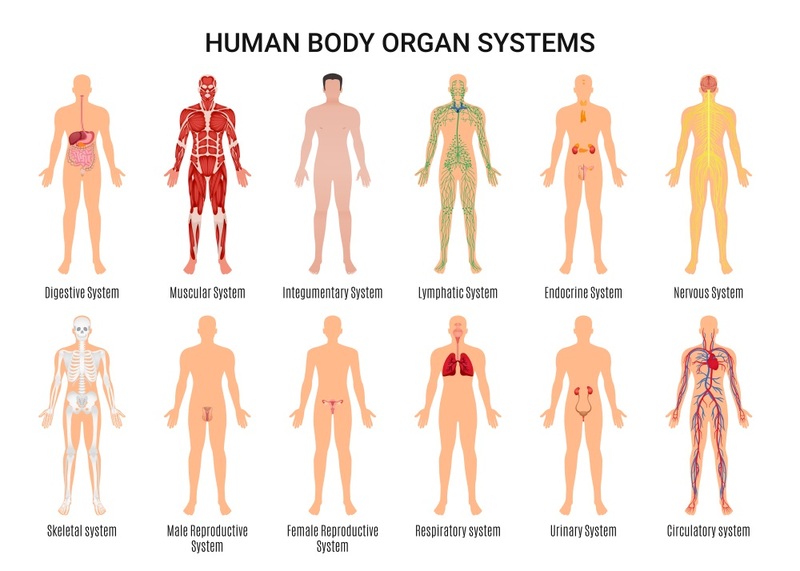 There are many different types of organ systems, across many different types of organisms. Every species have slightly different versions of an organ system. Some species may not need a various organ system, or it has yet to be discovered by science. Below is a list of 11 typical animal organ systems, plus the unique organ system of plants. This list includes both the function of these organ systems, and their potential differences between species. The circulatory system is responsible for circulating blood within organisms. This organ system varies greatly depending on the organism. For example, while humans have a single four-chambered heart, there is no “normal”. Other animals, such as fish, have a 2 chambered heart. Reptiles have a 3 chambered heart, which is similar to our heart but has only a single ventricle. An octopus has 3 separate hearts, which pump blood to different parts of its body. The circulatory system also includes the arteries and veins which carry the blood. As with the heart, these tissues vary widely between organisms. In general, blood vessels are made from epithelial tissue, the same tissue that makes skin. This gives vessels an elasticity, allowing them to flex as the heart pumps. The digestive system of an organism is designed to extract energy from the food an organism consumes. The digestive system is highly variable, depending on the organism and what it eats. It typically consists of a stomach, small and large intestines, and variety of glands to aid digestion. These different parts of this organ system change greatly between organisms because of the requirements for digesting different foods. An herbivore, such as a cow, may have a large and complex digestive system. For them, this organ system contains multiple stomachs and a length of intestines which would be several times the length of their body if stretched out. This allows many different microorganisms to inhabit their gut, and help them digest food. By contrast, carnivores have a very short gut, typically close to the length of their body. This is because meat digests much faster, and rots if left in the gut for too long. Every species also has a distinct set of glands, which secrete digestive chemicals into the gut. These chemicals have evolved to help digest the foods the animals typically eats. Being a multicellular organism requires an advanced level of coordination and control throughout the body. This organ system is responsible for creating and regulating hormones, the chemical signals which control the cells of your body. This system consists of a bunch of different glands and tissues, scattered throughout the body. In humans and other mammals, this organ system controls hormones like insulin, testosterone, and cholesterol. Other animals have many different hormones and control systems for their development and growth. In the process of digesting and metabolizing energy for growth, certain substances are accumulated and produced which are toxic to the cells of the body. These substances must be excreted if the organism will survive. This organ system is composed of a variety of organs suited to this purpose. In humans, this organ system has components like the kidneys and liver, which filter the blood and remove toxins. It also includes organs like the bladder and colon, which actively store the substances and excrete them from the body. The lungs also serve as a point of excretion, as do the gills in fish. In many organisms, including humans, the skin is also a large part of this system. In all organisms, there is a need to identify your own cells and destroy invading cells. Without this organ system, bacteria and small organisms would quickly invade your body and take over. The immune system varies by organism, but its general purpose is to keep invading organisms out of your body. In humans, the system consists of specialized cells, such as white blood cells, which search through the body for invading bacteria, viruses, and proteins. This organ system usually functions by producing antibodies, which lock onto specific proteins and allow the immune cells to identify outside cells. The integument is the tough outer layer of an organism, which exists to protect it from desiccation and harm. The skin is the largest organ of the human body, and is an important organ system in most animals. In some small animals, the skin even serves as a site for gas exchange and can negate the need for gills. Still other forms of this organ system include hairs, spines, or other adaptations for survival. This system is often combined with the skeletal system and called the musculoskeletal system. That is because this organ system functions by moving the skeletal system. Muscle tissue functions through a complex network of multiple systems, including the skeletal and nervous system. When an individual muscle cell is given the signal to contract, proteins within the cell move past each other and shorten the cell. When this happens to a whole group of cells within a muscle, the muscle shortens. This action can move body parts, squeeze an organ, or hold a sphincter shut. This organ system contains all the cells and tissues responsible for communicating electrical signals within an organism. Nerve cells work by passing electrical potentials down there lengths, and transferring the signal to other cells. Beyond passing signals, the nervous system also contains the organs responsible for collecting information from the environment, such as the eyes, ears, and tongue. Though many animals do not have a large brain like humans, most have some sort of concentrated nerve cells, which process information. While plants do not have a formal nerve organ system, they do have some components which respond to stimuli from the environment. Most multicellular organisms are aerobic, meaning they rely on oxygen to survive. To get oxygen to the cells deep inside a large organisms, they need a specialized organ system to carry out the process. Seen as lungs in terrestrial animals and gills in aquatic animals, this organ system transfers oxygen from the environment into the blood and cells of the organism. The system also removes gaseous waste products, such as carbon dioxide. All multicellular organisms that reproduce sexually need an organ system to do so. These organ systems produce gametes, which are specialized cells capable of combining to form a new organ system. In humans, this organ system includes the testis, ovaries, uterus, and other organs involved in reproduction. This theme is largely conserved in the animal world, though methods of reproduction vary. Plants have a unique organ system for these purposes, including organs such as flowers and pinecones. Though this organ system is not an absolute necessity of life, it is found in various forms in different animals. Some animals, like humans and most tetrapods, have an endoskeleton. This is a series of bones and cartilage that exist internally, and give something for our muscles to attach to. Other species have an exoskeleton. As seen in insects and crustaceans, this is essentially the same idea, but on the outside of the body. Still further, other organisms like worms and sea stars have a hydrostatic skeleton, which functions through water pressure contained within the body. Plants have an organ system arrangement that is unique compared to other organisms. Typically, plants have two organ systems, the root system and the shoot system. The root system includes the tissues below ground, responsible for collecting water and nutrients. The shoot system is divided into two parts. The vegetative organ system have leaves and stems, and produces sugars via photosynthesis. It then transfers these products around the cell. Many plants also have reproductive parts, which are usually a part of the shoot system. Each organ system in a fish is adapted to its environment. It has gills as part of the respiratory system, which works with a 2-chambered heart in the circulatory system to move oxygen around the body. The fish has a stomach and intestines to digest food, and an organ system devoted to reproduction. The excretory system is rather simple, as the fish lives with plenty of water to flush toxic wastes from the system. Almost every system in a mammal is a derived version of the original fish system. The respiratory organ has evolved into a lung. The heart has developed 2 more chambers, to help pump blood under the pressure living terrestrially. The stomach and intestines changed very little. The excretory system is more advanced, to retain as much water as possible. In a terrestrial mammal, each organ system is optimized to this task. Though the systems may have more or different components, each organ system serves essentially the same purpose as it did in the fish. 1. Which of the following is an organ system? 2. Which of the following organ systems is NOT found in all organisms? 3. An organ system contains which of the following?